We are very glad to present our new floating hotel MS Concerto Nile cruise to be added to our fleet (M/S Miss World and M/S Princess Sarah) M/S Concerto has 63 cabins + 4 suites with most luxury facilities founded in the floating hotels. A Cruise down the Nile is one of the best ways to see the incredible ruins of ancient Egypt. 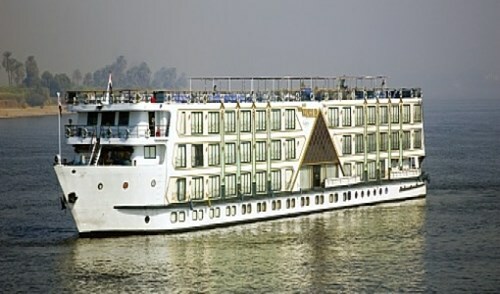 All Nile Cruise tours led by an expert guide can enhance your understanding of these ancient places. Prices are quoted in US Dollars per person per trip except during Christmas, New Year & Easter holidays. You can pay in Euro or British Pound. All our Egypt tours and excursions don’t include entrance fees to special archaeological sites such as entering one of the Pyramids inside, to visit solar boat museum at the Pyramids area, to visit the mummies room at the Egyptian museum, or to visit the tomb of King Tutankhamen at Valley of the Kings. Confirmation will be received within 48 hours of bookings. Book Now Pay On Arrival, the easiest and safe way to book any tour & activity in Egypt. We advise if you are willing to offer it, this would be great. The restaurant is equiped to serve 140 Pax in one sitting and offer=buffet and Set menu according to the program.